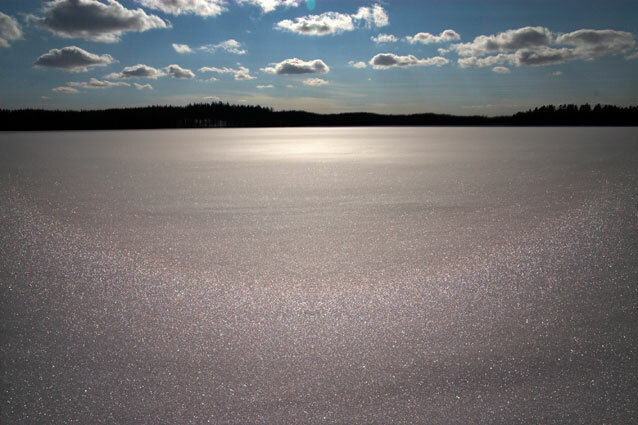 On 22nd March Jari Piikki photographed a 46° halo on snow surface. He took 20 photos and stacked them to come up with a photo above. The sky is from a single frame. very nice, I've never seen a 46° halo yet myself, neither in the sky nor on an ice surface. Could you see it with your eyes as well, or did it only show up with the stacking? it looks like there is a colour shift too, from reddish on the inside to more bluish towards the outside. Was there no regular halo? Or would it have been off the ice due to high sun elevation? Or do they not occur together? Yes, Peter, according to Jari the halo was easily visible with naked eye. He continues telling that the halo was not especially bright but rather a typical 46 halo on surface. However, the stacking has surely intensified the effect on the photo. 22 and 46 halo do occur together indeed. Every time there is a 46 halo there is also a 22 halo. This time the Sun was too high for the smaller halo to appear on surface, as you mentioned yourself too. 46 halo on snow surface is very common, possibly more common than 22. You just have look for an area of spectrally colored crystals. Sometimes only 46 halo is visible.